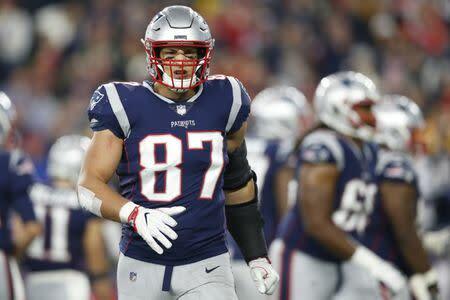 New England Patriots tight end Rob Gronkowski was downgraded to doubtful for Sunday's game against the Chicago Bears, the team announced Saturday evening. ESPN reported earlier in the day that Gronkowski did not travel with his teammates to Chicago and was "highly unlikely" to play. Gronkowski has been limited in practice throughout the week because of ankle and back injuries. He was originally listed as questionable for Sunday's game along with nine others. Three of those others -- defensive ends Geneo Grissom and John Simon, along with tight end Jacob Hollister -- were downgraded to out on Saturday. The 29-year-old Gronkowski has battled injury issues throughout his career. He missed 10 regular-season games from 2016-17 but has yet to miss one this season. In six games this season, Gronkowski has 26 catches for 405 yards and one touchdown while playing 91 percent of snaps. He has hauled in 77 touchdown passes in 108 career games. --The Los Angeles Chargers downgraded standout running back Melvin Gordon to questionable due to a hamstring injury, promoting rookie running back Detrez Newsome from the practice squad and releasing linebacker Emmanuel Ellerbee a day before the team plays Tennessee in London. ESPN's Adam Schefter reported Gordon "will most likely be a game-time decision" for the 9:30 a.m. ET kickoff. If Gordon can't play, Austin Ekeler would become the primary back. Ekeler has 263 rushing yards -- he is averaging 6.4 per carry, second in the NFL among qualified leaders -- and has caught three touchdown passes. --The New York Jets are set to release wide receiver Terrelle Pryor, ESPN's Adam Schefter reported. Pryor has been hampered by a slight groin tear and has been limited to 14 catches for 235 yards and two touchdowns through the first six games. A quarterback in college, the converted wide receiver has 113 catches for 1,546 yards and seven touchdowns over 49 career games. Pryor had five catches for 57 yards and a score in a Week 6 win over the Indianapolis Colts, and Schefter did report the Jets are interested in bringing Pryor back when he is healthy. --The Jacksonville Jaguars placed rookie offensive tackle Will Richardson on injured reserve and activated running back Carlos Hyde, a day after acquiring Hyde from the Cleveland Browns for a fifth-round pick in 2019. The Jaguars traded for Hyde due to the season-long hamstring woes of standout running back Leonard Fournette, who has played in parts of only two games. Current starter T.J. Yeldon is bothered by a sore ankle, and original third-stringer Corey Grant (foot) is on injured reserve. --Cincinnati Bengals linebacker Vontaze Burfict was fined $112,000 for multiple illegal hits made against the Pittsburgh Steelers last Sunday in Cincinnati. In 11 NFL seasons, Burfict has been fined more than $415,000, in addition to two suspensions totaling six games, including a three-game suspension for a hit on the Steelers' Brown in a playoff game following the 2015 season. --The Houston Texans have activated safety Andre Hal, the next step in his inspirational return to football after a successful battle with Hodgkin lymphoma. Hal, 26, had been on the non-football illness since his diagnosis in early June. He announced last month that his cancer was in remission and he returned to practice on Wednesday. --The San Francisco 49ers released quarterback Tom Savage and gave that spot on the 53-man roster to Tyvis Powell, a defensive back who is being promoted from the practice squad. Powell could provide depth in the secondary this weekend as the 49ers prepare to host the high-powered Los Angeles Rams. Savage, 28, was signed on Tuesday but lasted less than a week with the 49ers. San Francisco will stick with C.J. Beathard and Nick Mullens as its top two signal-callers. In 13 career games (nine starts), all of which were with the Houston Texans, Savage passed for 2,000 yards, five touchdowns and seven interceptions. His teams went 2-7 in games in which he started. NBA says Jarrett Allen was fouled in fourth quarter against 76ers.